In the dark about Instagram? This social network is one of the fastest growing social media platforms on the web. Find out all you need to know about using Instagram for your business in this post. Social media is not everyone’s speciality – luckily for you, it is ours. We’ve got a wealth of digital experience behind us, including social media management. Whilst tonnes of our staff love their social too. However, using Instagram for business, instead of personal use, is very different. It’s less about ‘express yourself!’ and more about branding. Which means, there’s a right way to post things, and a wrong way. Just like there’s things you should post and things you shouldn’t post too. 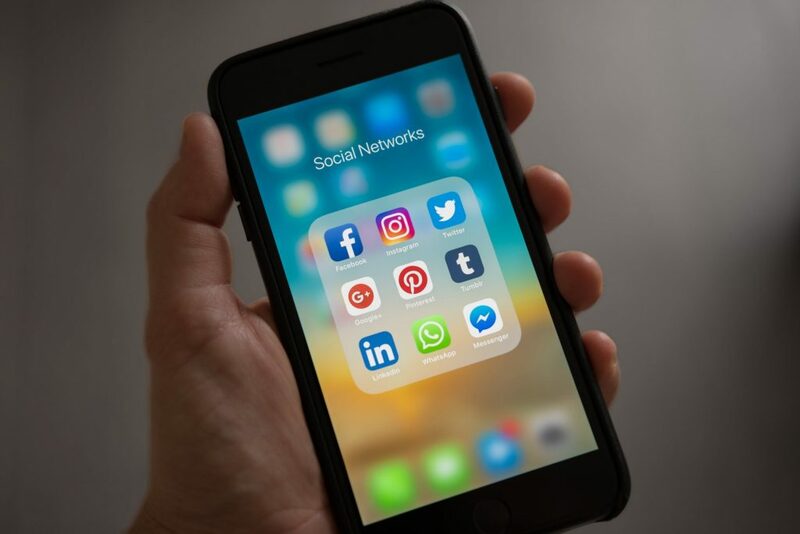 There’s guidelines that businesses and brands should follow when cultivating their social presence online, especially on Instagram. The nature of Instagram makes it ideal for some business, however, it’s not for everyone (but we’ll get to that). This is, our guide to using Instagram. Instagram was first rolled out back in 2010 and was launched as a photo sharing application for IOS and available through Android apps. The mobile app took off, eventually being bought by Facebook (Mark Zuckerberg’s Company) in 2012. Since then the app has grown and grown. According to Statista, as of late September in 2017 there were a total of 800 million active monthly users on Instagram. The service has continually grown since Facebook acquired it, adding new features and services, like incorporating Facebook’s Ad systems. But again, we’ll get to that. All you need to know about Instagram is that it is a picture and short video content service. We’ll get into the features below. 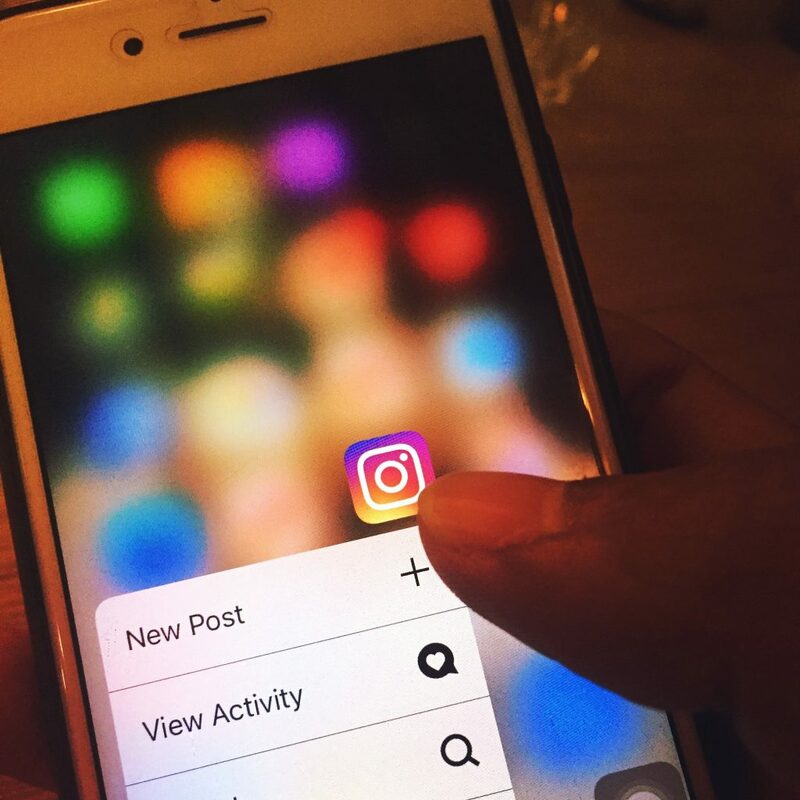 The main feature of Instagram is the ability to post pictures and short videos onto your profile, which in turn are shared onto users’ feeds (that follow you). Think of it like a photo and video kind of Twitter. Your content will appear on users feeds and people you follow will have their content shown on your feed too. You can add filters to your visual content, editing them (using the photo editor) with pretty in-depth tools, such as contrast, brightness and more. Videos must be no longer than 60 seconds to be uploaded on Instagram and must exceed 2-3 seconds to be uploaded as a video. Introducing hashtags (up to 50) to your posts makes them discoverable through the explore section and searchable, as well as adding captions to your content (up to 2,200 characters). Users can search for hashtags and profiles via the search bar. Your posts can be interacted with through liking, commenting or sending it via direct message to other users. Both video and photo content can be uploaded via the story feature on Instagram. This type of content will remain on your profile and the top of users’ feeds for 24 hours (unless it is saved as a highlight on your profile). Commenting on a user’s story, will send a direct message to the posters inbox, and stories can be shared via direct message. Stories can be replied to using a picture. You can post on your story with previously saved content (from your phone) or you can film / snap through the feature to edit and upload. There’s the ability to add tags (for other users), hashtags, filters and stickers too. You can also go live on the feature, broadcasting a live story. You can use Instagram to create paid promotions on users’ feeds. Through Facebook’s Ad software, you can target a certain demographic in a location, and your post ad will appear on their feeds. Clicking on the add will usually link to your website, either a landing page or specific product/service. It’s an extremely handy tool to directly reach your selected market. Using analytic tools (only available on business profiles) you can set up analytics for your Instagram account. You can see total engagement across your pages, demographics on your following and much more too. Other Features: Instagram has loads of other features including live streaming, saved photos and analytics too, to monitor your accounts influence and engagement too. All you need to do to get these analytic tools, is link your Instagram account to a Facebook business page. You’ll now have an Instagram Business verified account. 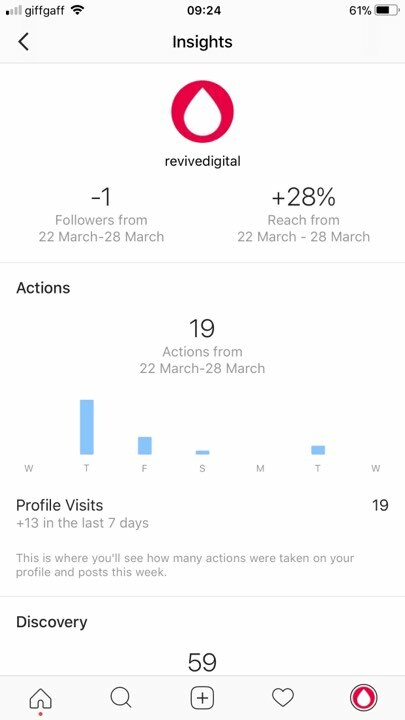 Keep an eye on these analytics, you can monitor what posts perform well and how many followers you have lost or gained. As you can see, your Instagram profile will list your address, and external links to your website. Your profile also allows calls, emails and directions to your business at the touch of a button (compatible with IOS and Android). Below, you can see the built-in analytics, known as Insights. Want a demo on how to post a photo on Instagram? Check out our video. As we’ve mentioned, you can edit your post with filters and add hashtags too. Simply click the button at the centre of the control bar at the bottom to post! To maximise your social media engagement, you need to post your content at the right time. Whilst it may be convenient for business owners to post when they’re free and have the time, it’s not always what will be pest for your content. Knowing the right time isn’t always easy, but there are some simple steps you can follow, according to data from Later (an Instagram scheduling tool). For starters, post when the majority of your followers are actually awake. That means, utilising Instagram insights, looking at geographical location. To make sure you’re posting for the right time zone, find our where the majority of your followers hail from, to ensure maximum engagement potential. Next tip is to post outside of working hours. So, usually between 11-1 (lunch time) and in the evenings between 7-9pm. Whilst it’s tempting to post when you’re sitting at the desk, don’t. Chances are your post won’t be seen and engaged with as much. Finally, important posts should be posted within the week. To truly maximise engagement, Later found that the best performing posts were on Wednesdays and Thursdays. Their data showed that Sunday posts had the least. However, it’s relative to your business. So, keep your audience in mind when you post. Later has tools available to calculate the best time to post your content on the social service but you can do your own research too (using the Insight tools). Sometimes you can collect your own data through trialling different times, just keep a record of when you post and how well each post does at different times. It may take a while, but you’ll crack the code eventually. For those busy business owners running their Instagram on their own, luckily there are some handy tools out there to help your post your content at the right time and in bulk too. Later is a specific tool used for scheduling and posting Instagram content. The plans range from free to around $49 a month, allowing you to queue up both photo and video content. So, as you should know by now, the type of content you can post on Instagram is photo and video. However, what should you be posting for your business’ Insta? First, let’s emphasise that all your content on Instagram should be of the highest quality possible. Whilst you don’t need a full photography crew, you do need a quality camera. Luckily, most phones have one of these built in already. So, at the least you should be using a top of the line phone camera for your snaps. The internet, as a whole, isn’t a fan of grainy low-res photos – especially on an app like Instagram. So, make sure your pics and videos are the best they can be. With every business, there’s the product or service that makes the money, but there’s the people that run it too. Don’t forget about them. 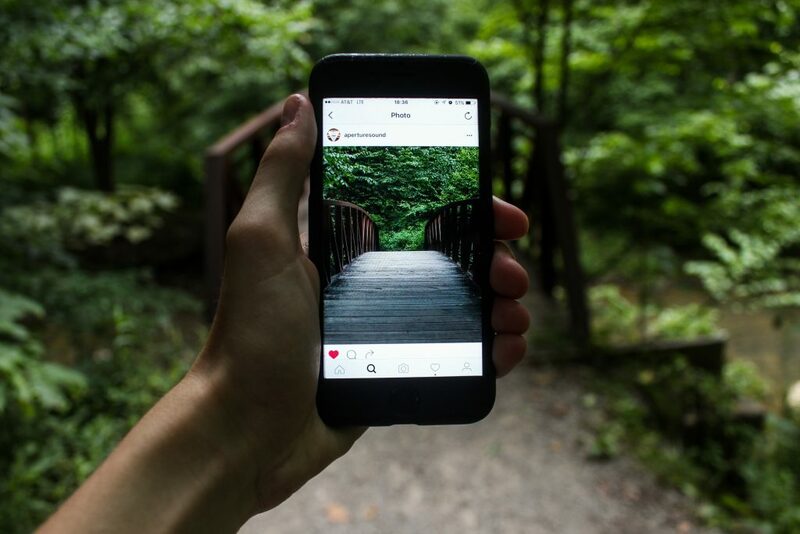 In fact, utilising the ‘human’ aspect of your business can do wonders for your Instagram. It’s the kind of content people want to see, the work force behind a business. Instagram’s Story feature is prefect for showcasing this. It gives followers of your brand and business a ‘behind the scenes’ look at your operation. Make it fun and light-hearted, it will show that your brand is more than just a business. Utilise the story feature to showcase your team. Make sure your content is relevant to your brand. Nothing will disassociate followers more than posting content that they don’t want to see. That means posting industry and brand related videos and pictures. It’s all about creating an enriching experience for your followers – that’s content marketing 101. The right content, at the right time can boost your engagement on Instagram and develop your brand. Who can benefit from Instagram? The best businesses for Instagram are those that have focus on visual. Take us, we’re a web design and marketing agency. We specialise in branding for our own business and our clients. Which means our Instagram has to look good and be on brand, as an example of what we can offer prospective clients looking for branding. It also lets us show off our website design capability too. But enough about us. The focus for your Instagram should be content of your products and services. A bakery for example should utilise their Instagram to show off their products, as should a clothing retailer. For businesses and brands that provide products, Instagram is an essential. That’s not to say that it won’t benefit every business, it just is more beneficial for some. It’s about weighing up the time Instagram takes against the potential business it can bring in. And hey, there’s always outsourcing to us. 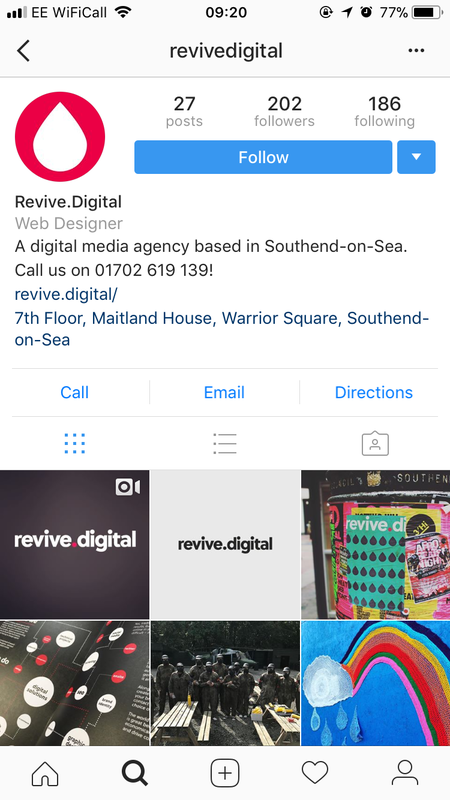 As part of our digital marketing services, we offer social media management, including Instagram and our graphic design team can offer branding packages (which include your socials). Know your audience and provide them with the right content. Make it high quality and human, whilst posting at the best time. Utilise insights to better your business’ Instagram account. Looking for that quiz we mentioned before? Well, it’s not here. But it got you to read to the end, right? Can’t do it alone? You know where to find us. Get in touch using our Contact page for information.